How to better engage your target audience, no matter what medium you’re using to connect with them. Stick with me here, and look for the clues about how to engage your target audience. Leading up to Christmas, my wife Georgie, and I recognised that we really needed a break. Somewhere far enough that we could be a long, long way from work. Yet not too far to eat up our holiday time in travel. We decided to have nine days staying in Hoi An on the central coast of Vietnam. Having been there once before, we were keen to return. Reasonably well-organised (i.e. passports, tickets and accommodation sorted) we finished work Christmas Eve and made it to the airport for our flight at 1.00am Christmas morning. 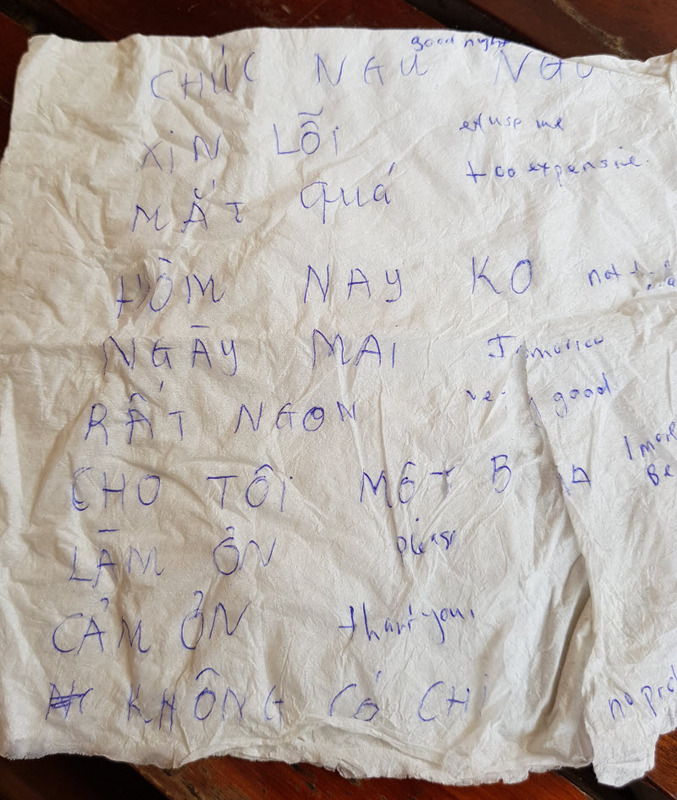 And that’s because most Vietnamese people that we attempted to converse with appreciated that we’d made some effort to at least try and speak their language. Encouraged by their feedback (usually laughter), we tried to expand our repertoire. Café owners and street hawkers were very generous with their time in helping us out with this. 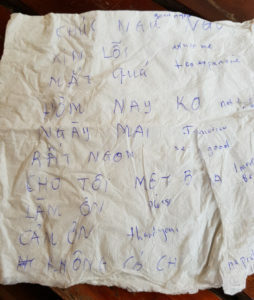 One (the famous Lu Lee – who I’m sure you’ve met if you’ve been to Hoi An) – even wrote us a list of common phrases, on a cafe napkin, of course! I even managed to get as far as, “Xin Loi. Cho Mot Bia. Lam On.” (Loosely meaning, “Excuse me, can I have one more beer please?”). Mostly this drew either laughter or a quizzical look…and some further crash course lessons in pronunciation. So how can you apply this to engage your target audience? Your clients appreciate it when you speak their language. You’ll be able to connect and engage with them better and develop a stronger relationship. Think of or find out the words they use, common phrases or terminology and try and use these genuinely. You can even apply this principle the next time you write an article, record a podcast, do a video or send an email. PS – Want more help? I run a crash course in grass roots marketing as well as coaching programs and courses to help you refine your presentation skills.